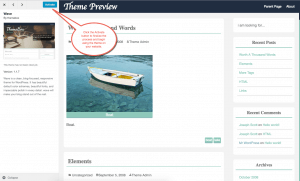 Themes are addons for WordPress that simplify the layout and design of your website. 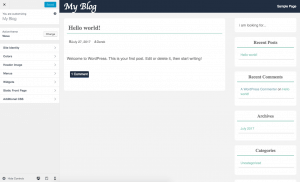 One amazing part of WordPress is that you do not have to be a developer and you really don’t need much coding experience. 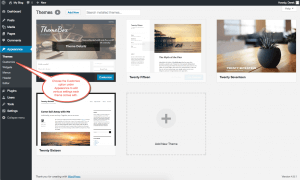 By using one of the downloadable themes that many WordPress developers provide for free, premium, or even custom built, you can get started building your website right away. 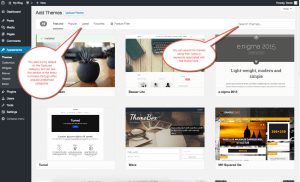 Let’s start out looking at the free themes that are available inside of your WordPress administration areas theme marketplace. 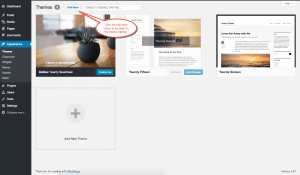 To begin, let’s login to the WordPress administrator and hover over the Appearance item in the left-hand menu, as you hover over the item, a new menu will appear with several options, let’s choose Themes. Once you click Themes under the appearance section, you will be taken to the following page. You will notice a list of the themes you have already installed, and we will click the Add New button in the upper left-hand corner of the page. After selecting Add New, you will be taken to another page where you will see a list of available themes to download which are trending as popular themes people are using by default. You will also notice several other predefined categories to the left in the menu up top. To the right of those options, you will notice a search box where you can search for a theme you have in mind by name, or other keywords. Once you have located a theme that peaks your interest, simply click the screenshot of the theme to be taken to the Preview of the theme as it will appear when you install it on your website. You can select Install in the upper left-hand corner to install the theme if you like it. Once the theme has been installed, the button in the upper left-hand corner will change from Install to Activate, we will need to click the Activate button in order to complete the process and begin using the theme on our website. Now that you have installed your new theme. Be sure to head back over to the Dashboard by clicking the X in the upper left hand corner, and then choose Customize under the Appearance portion of the left-hand menu. Most themes come with various predefined options you can change easily from inside the Customize section. For example, the Wave theme allows me to configure the Site Identity, Colors, Header Image, Menus, Widgets, Static Front Page, and Additional CSS with ease. And that’s it! You are now ready to begin working on the content you want throughout your website. You can also install themes that you find in other places. 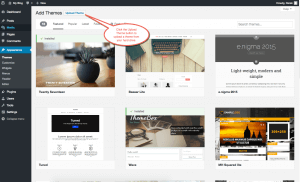 A quick search of Google for Free WordPress Themes, WordPress Themes, or Premium WordPress Themes will net you a large array of options both free and premium. You can also search up “Custom WordPress Website Design” for a list of providers who custom build WordPress themes if you’re looking for something more unique. 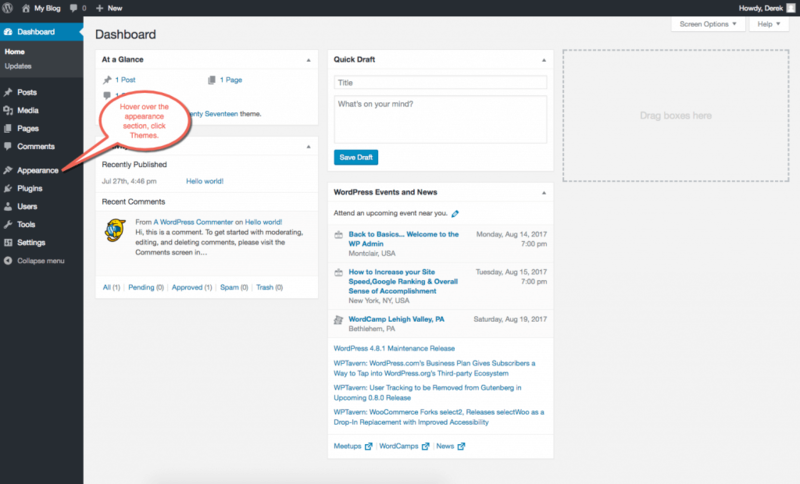 If you choose to install a theme from an external source, you will need to first download the installation file from that provider, and then login to your WordPress administration area, and hover over Appearance then choose Themes like we did before. When you click Install New this time, look up top for the “Upload” button, you’ll choose the file from your local hard drive and upload it. Once uploaded, click Activate. If you need additional assistance surrounding finding, installing, or using a WordPress theme, please feel free to reach out to the support team for further assistance.